so, he decided that the phenomena associated with Spiritism were worth serious study, and in 1961 he and a group of like-minded friends founded the Brazilian Institute for Psychobiophysical Research (IBPP) with the objective: “The study of paranormal facts and systematic research into the laws, properties and potential of the spirit by scientific methods”. In his first book, A Teoria Corpuscular do Espirito (The Corpuscular Theory of the Spirit, 1958), he upset some of his fellow Kardecists by telling them that “The ridiculous strategy of the ostrich is to be avoided at all costs. Kardec had insisted that Spiritism had to be scientific as well as philosophical and religious if it was to survive. Although the IBPP was always a small group, Hernani and his colleagues amassed a remarkable amount of first-hand evidence for a wide variety of psi phenomena, notably his two special interests, poltergeists (32 cases) and reincarnation (75 cases). Field work always came first. 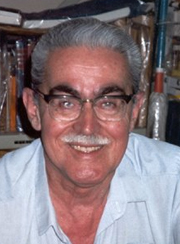 At the age of eighty Hernani drove several hundred miles to investigate an unusually persuasive case of claimed reincarnation on which he published a full-length book, Renasceu Por Amor (Reborn to Love, 1994). He also found time to write fifteen other books, the last of which was published a few months before his death. These include the first Brazilian parapsychology textbook, Parapsicologia Experimental (1967), several original case histories, and a number of theoretical works in which he put forward his detailed theory of the ‘biological organizing model’ behind all forms of life, and the connections between matter and spirit by means of an organizing psi field and what Kardec called the ‘perispirit’ body. detailed verification of an unusually convincing drop-in case; Psi Matter (1976), a summary of the theoretical work mentioned above, and A Case Suggestive of Reincarnation: Jacira & Ronaldo (1980), one of the best cases of its kind in the IBPP files, all of which were meticulously compiled by IBPP archivist (and active field researcher) Suzuko Hashizume. Hernani was a man of infinite kindness: but for his encouragement and infectious enthusiasm I might never have become involved in psi research at all. The time I spent with him and his colleagues from 1973 to 1975 amounted to a prolonged private tutorial with an incomparable teacher and friend. This continued through correspondence until shortly before his death. website with the author’s and Editor’s permission.